Richland Hills is a small community that is considered to be part of the greater Fort Worth area. People who call this area home generally work hard and want to spend their free time pursuing their interests instead of cleaning. That is why it is worth your while to consider hiring a maid service in Richland Hills. Love My Maids will help you free up your valuable time for more pleasurable pursuits. Professional house cleaning isn’t a one-size-fits-all service. You can bring in Love My Maids professionals for specialized cleaning around the holidays or to help with larger than average spring cleaning projects, or you can bring them in regularly to clean your home on your schedule. 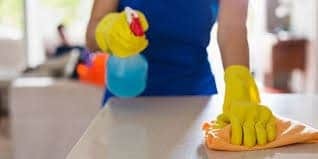 These services can make a world of difference for your home when guests are visiting or when you simply want a deeper level of clean. Vacuuming and dusting all floors (plus mopping all hard-surface floors). Dusting furniture, window sills, door frames, and ceiling fans. Removing trash and changing liners. Cleaning your microwave (interior and exterior). Splish splash the day away at NRH20 Family Water Park in nearby North Richland Hills. This park has it all, and it’s a great way to spend the day when the temperatures begin to soar. With a variety of attractions, there is a little something for everyone in the family to enjoy. Read a good book. See how you can ignite infinite possibilities at the North Richland Hills Library. Take the family for a day of play at Mountasia Family Fun Center. From thrilling rides to laser tag, arcade games, and batting cages, there are plenty of activities for everyone – even the little ones. The city’s proximity to both Fort Worth and Dallas also means that all of the activities available in those cities are just a short drive away. There are so many grand adventures waiting to be enjoyed by all. You won’t be able to fit them all into your tight schedule if you’re giving up days of your life cleaning. Office cleaning services are critical for Richland Hills, TX businesses. This is especially the case during allergy season and cold and flu seasons as professional cleaning services not only clean the surfaces throughout your office space, but also sanitize them. Working with a professional office cleaner that is bonded and insured means that you can rest assured that your office is being cleaned thoroughly and professionally. Love My Maids is ready to tackle your toughest cleaning jobs so you can enjoy your time on your terms. Contact Love My Maids today for a free online quote about your cleaning service needs or call us at (817) 542-0347 to book your cleaning today.